With target-shooting activity peaking during summer months and youngsters finishing the school year, now is a good time for gun owners to review procedures for storing their firearms safely at home, says the National Shooting Sports Foundation, the trade association for the firearms industry. NSSF reminds firearm owners that on returning home after spending a fun day at the shooting range to immediately secure firearms so that a child or other unauthorized person cannot access a loaded gun. "Nearly all firearm accidents can be prevented by following a few simple safe-storage steps," said NSSF's Director of Communications Bill Brassard Jr., who oversees the Foundation's safety education programs. "Accidental firearm fatalities are at historic low levels thanks to the precautions taken by responsible firearms owners and because of safety reminders promoted by NSSF and other concerned groups." Putting firearms away unloaded and storing ammunition separately--both in locked locations--can prevent a tragic accident from happening. Gun cabinets and gun safes are excellent locked-storage options, and adding a gun lock to a firearm provides an extra level of safety. Taking such precautions is particularly important during summer not only because people use their firearms more often for target shooting, but also because children are home from school and sometimes left unsupervised. "Children are naturally curious. They have a knack for finding things adults don't want them to find," said Brassard. "Hiding a firearm in a drawer or a closet is not a substitute for locked storage." Those who keep a firearm for home protection must develop their own safety precautions to create a situation in which the firearm is available to them and not to an unauthorized person. 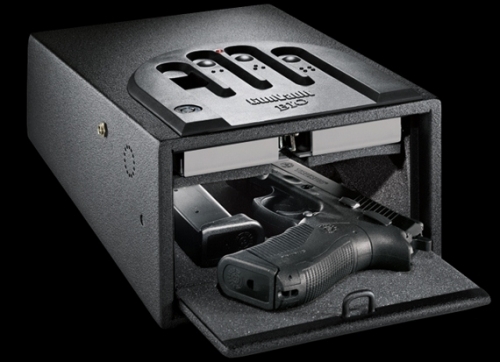 Quick-access lock boxes are one solution for the person who keeps a firearm for home defense and also has children in the home. "It's one of the most important responsibilities of every gun owner to prevent a child from accessing a loaded firearm." Safe gun handling and safe storage go hand-in-hand. When going target shooting this summer, it's a good idea to review the basic rules of firearm safety, especially with newcomers. The four basic rules are . . . Always keep the gun's muzzle pointed in a safe direction. Know your target and what lies beyond it.